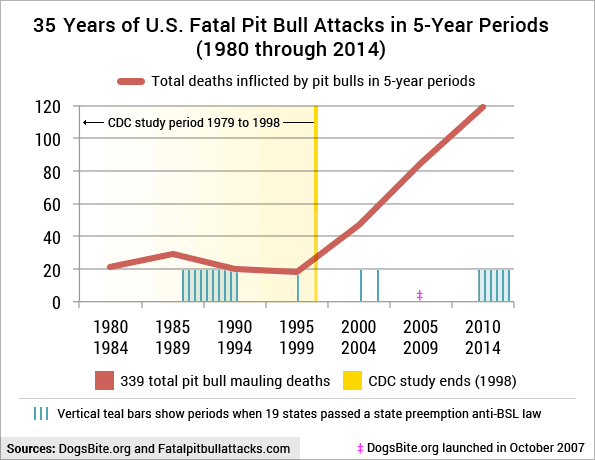 Chart illustrates 35-years of U.S. fatal pit bull attacks in 5-year periods. We added short teal vertical bars to indicate when each state passed a preemption law barring municipalities from enacting pit bull ordinances. We also marked the end of the CDC's 20-year study period, 1998, showing the dramatic rise in fatalities since. DogsBite.org - During the first quarter of the 2015 legislative season, state preemption bills prohibiting local governments from enacting breed-specific laws were brought in five states: Arizona, Georgia, Kentucky, Montana and Washington. In all five states the legislation failed.1 This is a 100% success rate for cities and counties retaining local control and a 0% success rate for the chief pushers of these bills, Utah-based fighting dog advocates, Best Friends Animal Society. To reiterate, so far in 2015, Best Friends has a 0% success rate in passing these state bills and in 2014, only had a 33% success rate. That is the bright news; the dark news is the 35-year death chart. 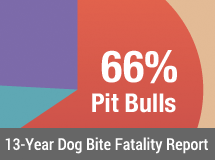 Deaths inflicted by pit bulls have increased by 560% since the 5-year period of 1995 through 1999, which includes the last four years of the CDC study. The CDC has no plans to revisit this issue either. On top of this, a second wave of state preemption bills erupted in 2012. Why any state legislator today would prohibit local governments from regulating this well-recognized dangerous dog breed is frankly inexplicable. State preemption laws backed by big industry interests are not new. Such laws were historically pursued by the tobacco industry, and continue to be today, to impede local tobacco laws. This strategy by the tobacco lobby was so successful that a range of other big industries began pursuing state preemption laws as well. Grassroots public health movements often suffer the most, as these laws essentially extinguish the motivation to organize and take action locally. In addition to home rule authority variances amongst states, state preemption laws vary as well. Primarily they center upon the prohibition of declaring a specific breed "dangerous" or "vicious" (prima facie legal designation). California, which has a mixed preemption law, explicitly allows for the regulation of specific breeds via spay, neuter status -- mandatory pit bull sterilization laws are legal -- but does not allow specific breeds to be declared "potentially dangerous" or "vicious." Despite 19 states passing these preemption laws, currently over 850 jurisdictions across 37 states in this country regulate pit bulls. On a federal level, all three major military divisions, the U.S. Army, U.S. Marine Corps and U.S. Air Force, outright ban these dogs and several other breeds on base and privatized housing. Federal and state housing authorities typically ban this same small group of dangerous dog breeds too. Even a large number of Indian reservations have followed suit. Victories in Missouri and Washington last year, and a growing number of advocates engaging in letter writing campaigns to state legislators, evolved into an even stronger effort during the first quarter of 2015, likely helping to tip the scale to a 100% victory. The real powerhouses, however, are the municipal associations that fight at a state-level to protect cities and counties from losing local control in a range of areas. Once that area of local control is gone, it's usually gone for good. Since the passage of the first state preemption law in 1988, barring breed-specific ordinances, not a single state has managed to repeal one. We expect four of these bills to return in 2016. Some may emerge in other states as well. It is not costly for Best Friends or dog breeder interests to get these bills introduced, often they are only one or two sentences long. But trying to pass them through both chambers can become expensive by hiring more lobbyists, local recruiting and more. Like the tobacco lobby, we expect these groups to be relentless in bringing these preemption bills in the coming years, until Wave II officially dies. Despite our health and safety cause lacking lobbyists and formal legislative organization -- which is directly opposite from Best Friends and dog breeder interests who have both -- our vital cause has so far been successful in 2015. Fighting these state preemption bills is not a sprint. Wave I lasted five years. It is unknown how long Wave II will last. We created the charts and information in this post to provide advocates with more materials when communicating with state legislators. Together we can do this! Grassroots health and safety advocates powerfully impacted first quarter's successful results, as well as in 2014. Our freight train is starting to roll and we need you on board! Understanding state preemption laws -- who typically brings them and who is typically harmed -- is the first step in coming on board. 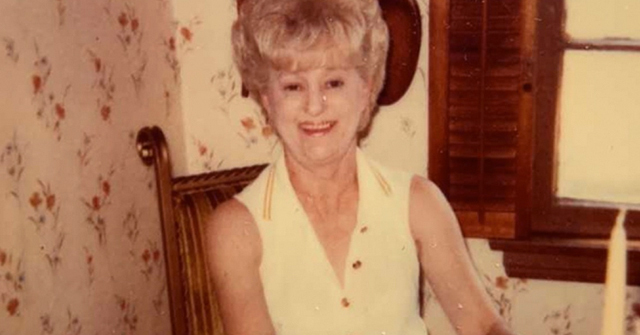 Advocates are now also armed with the powerful 35-year death chart that sends a concrete message to legislators considering one of these bills. Immediate at-risk states, as of second quarter 2015, include North Carolina. On April 14, state preemption bill HB 751 was filed that prohibits local governments from enacting breed-specific ordinances.10 At-risk states in 2016, expected to again face these state preemption bills, include: Arizona, Georgia, Kentucky and Washington. In Georgia and Washington, both state preemption bills introduced in 2015 automatically carry over into 2016 (known as "carry-over" legislation). Advocates please also read the related post, 2015 First Quarter Legislative Highlights, for a deeper account of the successes, lockouts and tough lessons learned during the first quarter. This post originally stated that 1982 was the first year a state passed this type of preemption law based upon reviewing Pennsylvania's 1982 Act 225. Upon closer examination of the 1982 Act, just after releasing this post, we found that Section 507-A was added to the 1982 Act in May 1990, right in the heart of the Wave I. 1First quarter failed legislation: Arizona Senate Bill 1292; Georgia House Bill 124 and Senate Bill 184; Kentucky Senate Bill 124; Montana Senate Bill 239 and Washington House Bill 1018. 4Of course there are lobbyists from the AVMA, ASPCA, HSUS and other humane groups that support these laws, but these groups are typically not the bringers of Wave II state preemption bills. That role is reserved for the strange bedfellows of Best Friends, dog breeders (AKC) and hunting dog groups. 5Illinois and Rhode Island are also home rule states, but no municipality has ever challenged this legal angle like the city and county of Denver did. "By introducing preemptive statewide legislation we can shift the battle away from the community level back to the state legislatures where we are on stronger ground." -Tina Walls, Philip Morris, July 8, 1994. (Preemption: Tobacco Control’s #1 Enemy). Here is another great read to help understand state preemption legislation and the usual forces behind it. The article also refers back to the infamous 1994 Phillip Morris quote: Big Food Strikes Back, Ag Industry Aims to Strip Local Control of Food Supplies, by Britt Bailey and Brian Tokar, CounterPunch, May 26, 2005 (www.counterpunch.org). 9When we say momentarily, we mean it. Many state legislative sessions only last for the first 90 to 120 days of the year, but others last longer, even the full year. More of these state preemption bills are coming down the pike in 2015. 10After locating HB 751, we performed more searches on the legislature's website and found that HB 271, a separate state preemption bill, was also filed in North Carolina in mid March. The preemption clause is buried within HB 271, which overhauls the state's dangerous dog law. HB 271 modifies section: 67-4.5. Local ordinances (see existing wording). Underlined type shows the bill's "added" preemption language. 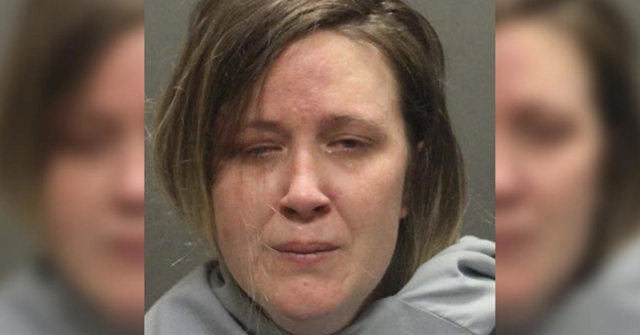 "Nothing in this Article shall be construed to prevent a city or county from adopting or enforcing its own program, law, or regulation for control of dangerous dogs, provided that no such program, law, or regulation shall be specific as to the breed, phenotype, or appearance of the dogs subject to it." Thanks for this article, as I'd never been able to articulate this "ban on bans" too well. I always make the point, love these dogs or hate them, preemption is totally hypocritical: Towns and cities often zone out barnyard animals… arguably for health and safety reasons but the county may not regulate my back yard full of pit bulls? What makes dogs so vastly superior to all other mammals? Interesting how this crosses known political boundaries: Red states Texas, OK and Utah have Preemption, but so do blue NJ, NY, CT and MA. 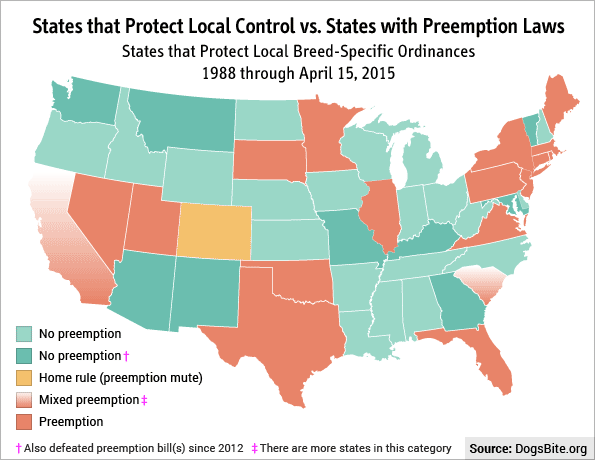 No Preemption in red KY, AZ and GA and also no preemption in blue WA, OR, VT and MD. The takeaway: Do NOT donate to Best Friends. They are NOT our friends! "Fighting dog advocates" is a very apt and appropriate description of what Best Friends Animal Society is. Even if they do not care about the human or animal victims of fighting breeds, they most certainly cannot claim to care about the fighting breeds themselves. 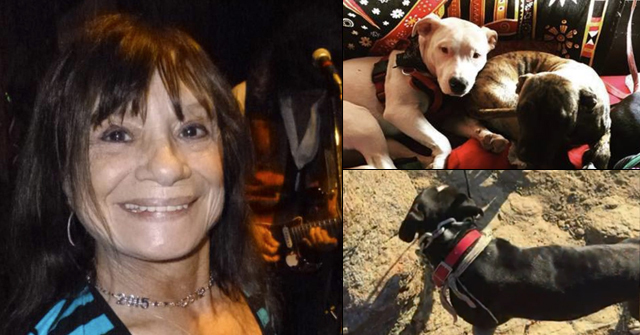 Things are worse than ever for pit bulls! Thanks in part to their efforts, the only ones in this mess that have prospered and proliferated have been pit bull breeders and dog fighters, with the parasitic interests of hoarders and dealers that abuse the dogs in order to profit on the side. When will Best Friends put aside their egos and admit that they've gone down a terribly destructive path that is failing for all but the exploiters of these breeds? This is an excellent article with very useful graphs that I plan to send people (incl. legislators) to in the future. I'm happy to live in one of the states without a preemption law, and am hoping to keep it that way. Thank you for putting this together. I live in PA and would like to get our preemption removed. I think it was enacted in the late 70s but am not sure. It has definitely been around for awhile. These charts are so helpful. I think I will give them to my aunt whose daughter has 2 pit bulls and is constantly spouting the they'll lick your face off nonsense. If only she knew how true that really is! Your Quiet Neighbor: I won't donate to ANY animal charity that deals with dogs. They have all become pit pushers, IMHO. This includes those $1 donations at PetSmart. Thank you for writing in from Pennsylvania! Your state enacted a preemption law barring local governments from enacting breed-specific ordinances during Wave I. A lessor known fact is that at the same time, Pennsylvania enacted the first insurance preemption law too. Insurers could not refuse coverage of a specific dog breed. Below is the 1982 Act 225, Section 507-A was added in 1990. Because of your comment, we looked more closely at Section 507-A. We had initially believed the whole portion was enacted in 1982. That is not the case, if you read the very last line! We have made an update to this post accordingly. Thank you for the link to the law. I actually was aware of the insurance preemption. I'm not sure how I feel about that. Not being able to get insurance can act as a stick for some people to get rid of a dangerous dog, but for others they would otherwise just go without insurance. It's good and bad. I called my local State representative and asked to speak with her about repealing the preemption. I'll let you know how it goes. The reason 19 states were able to pass public hazard state-wide anti-BSL laws is because the general public was unaware that these types of laws were even happening. Now there is a growing voice who have become aware to help stop these type of public safety hazard bills.